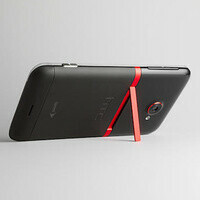 HTC EVO 4G LTE owners, listen up because today might be the big day. According to a spy shot of a document, supposedly coming from Sprint's internal network, your smartphone is going to get its dose of Jelly Bean today. The Android 4.1 update will be available on December 13, according to the document, with a network push scheduled to begin the week of January 3, 2013. 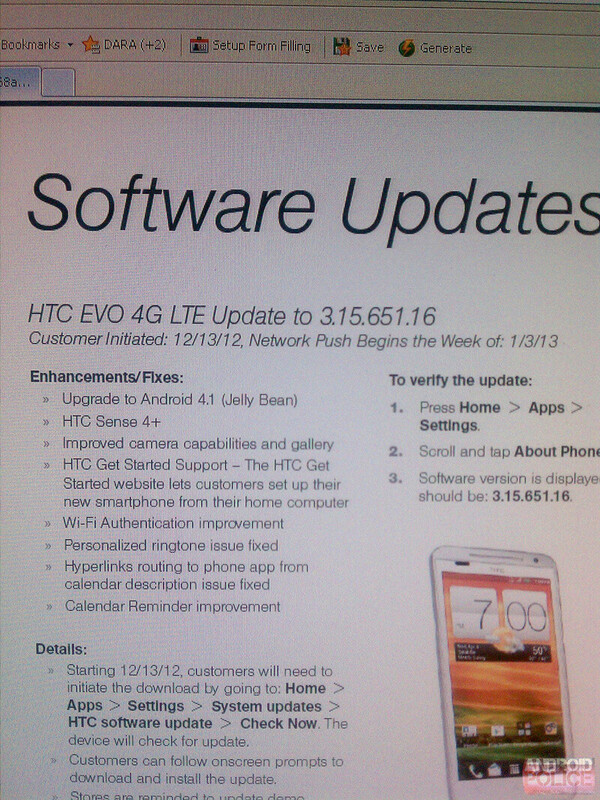 But if the software update really goes live today, you'll be able to get it on your HTC EVO 4G LTE by checking for it manually. Just go to Settings> System Updates> HTC software update and tap Check Now. The version number of the new software update is 3.15.651.16, according to the leak. Once updated, the HTC EVO 4G LTE will get a number of enhancements and fixes, such as the newer Sense+ user interface, an improved gallery application, and extra camera capabilities. All goodies that come along with Android 4.1 Jelly Bean should also be present, such as Google Now and the expandable notifications in the drop down bar. Naturally, a number of bugs have been squashed too. Keep in mind that all this is just a rumor so we can't guarantee that the HTC EVO 4G LTE will really get updated to Android 4.1 today. But on the other hand, the leak seems trustworthy, so we're feeling pretty optimistic about it. In case your EVO 4G LTE gets updated to Jelly Bean, don't hesitate to drop us a line in the comments below! UPDATE: Wow, that was pretty quick! 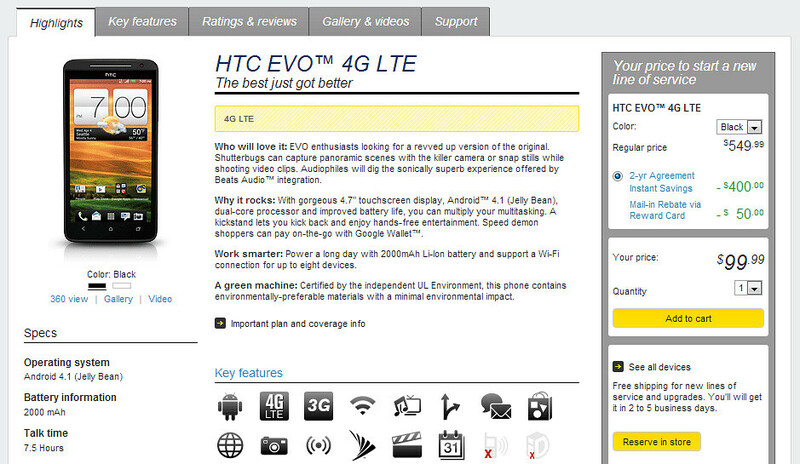 The Android 4.1 Jelly Bean update for the HTC EVO 4G LTE now seems pretty much confirmed. And the word comes directly from Sprint: on the carrier's web page, the smartphone is listed running Android 4.1 out of the box, as you can see in the screenshot. So get ready, folks! The wait is almost over. Thanks for sending this in! This has apparently been confirmed by Sprint's product page for the Evo: http://shop.sprint.com/mysprint/shop/phone_details.jsp?prodId=dvc6370014prd&deviceSKUId=63700579&ensembleId=APX325CKT&flow=AAL&firstSelection=PHONES&id16=evo%204g%20lte&question_box=evo%204g%20lte I've been clicking the update button for a couple hours to no success, so it hasn't started quite yet. Am I the only one who think that Sprint done tha good job for updating android device compare to other? They're good sometimes, not so good other times. In this instance they're pretty fast, it was only a couple weeks ago that HTC started updating the global One X. However, it took Sprint a month longer than AT&T to update the Evo to 4.0.4 / Sense 4.1. T-Mobile has been doing great so far also. I would prefer I'd the update reprocess were to be a little faster but we all know that's never going to happen. Sprint is really working hard at timely updates, they recognized its important to their customers. They were first to update the Galaxy SIII and now the EVO. In the past they have also been the better of the big 4, not great by any means but that is life with Android. First off, you dont know what youre talking about, this is SPRINT. OH.. AND BY THE WAY, THE UPDATE IS LIVE!!!!! WE GOT JELLYBEAN!!! Yes!!!!! I got my update about 2MINS AGO!!! Jelly bean... Here I come!! Me too, downloading it now. My HTC EVO 4G LTE is right now downloading the software update Android 4.1 as I write this comment. I want to unroot my phone so I can do this. Can anyone help out? I have team win recovery on it. I just started mine!!!! 4.1.1!!!!!!!! Idk if its just my phone or if its some kind of bug, but my beats headphones worked before i updated my phone this morning, now they dont work with the phone, I tried them on another phone and it worked just fine. Is anyone else having this problem? This update is good but I have the common problem with my wifi not connecting to my home network...anyone else having this problem? Any fix?